Best way to learn Spanish is starting with music and text. So what's the best way to learn Spanish I was asked so often. The best way to learn Spanish is with music to begin with. We all believe in the power of music. Julio Iglesias music on CDs has Spanish songs that are easy to memorize and to sing along. Their texts are often attached within the CD box. Place it in your social network also to give you the chance to practice Spanish with it often until you know the song by heart. You easily find many in Youtube if you search for them. Learn the Spanish alphabet to be able to read the language everywhere. Music television as well as Spanish music films belong to the most perfect ways. Watch free live entertainment Costa Adeje Easter plays or Adeje town and try to follow what is said. Get a good dictionary like Collins Concise Spanish, for home. You want to learn a little more about the songs. Order the CD el Poema by Los Sabandeños in any music shop when you are on holiday on the island or, have somebody you know on the Canary Islands buy and send it to you. El poema means the poem and brings over the story of the songs beautifully. There is a text with lyrics which comes with the CD. This makes the Spanish songs easy to learn. Insist that all CDs must have lyrics text, separately. Indeed, it's a best way to learn Spanish by singing church songs, the nicest of which are Christmas carols. There is much innovative church music around, these day, for people who prefer more of a beat. When I lived on mainland Spain I asked the priest to let me have texts of church songs in order to read them and join into the singing during mass. My son and I were in dire needs for a best way to learn Spanish while living in rural Tormos Spain, then. 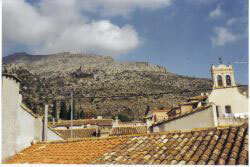 The photo taken from our top of our house shows typical Spanish roofs with Tormos Church near town Denia and mountains in background. Sometimes, church song and psalm books are obtainable in other places as well. It doesn't matter if you don't like to sing all the songs as long as you read and listen. You could, even join a quire to learn Spanish for this purpose. Once, my friend Lourdes took me to some special congregation - kind of a Spanish Newborn Christian Church - in Puerto Cruz by Taoro Park which wasn't Catholic. Modern music and singing was a big feature of this new way church. They had most song texts on a board by the church stage where musicians where playing guitars, flute and percussion. The young people in this church loved this musical approach for better singing along. Singing and reading the song texts in large letters would have been a best way to learn Spanish for me if I had become a member of this church. or in any Spanish speaking country or island. or with a private teacher. and take part in dance events, singing and more cultural activities for the elderly of any nation. There is nothing better than take and give to learn a language best. The smiles you are bound to get by voluntary work from grateful young people, for example, are priceless. You can help kids of nursery school age, sing for them in your own language, do games with them teach them some art. Guess what a rewarding perfect way to learn Spanish... What I would love is to teach some German, English or French to education hungry youngsters. I did this as a free-lancer, a long time ago, and I was good at it. I would perfect my Spanish while finding new meaning for life. Could there be a better way? A more rewarding best way to learn Spanish? All those options go hand in hand with my best way to learn Spanish with music for most wanted results. From best way to learn Spanish back to why learn Spanish with links for even more ways to study it. Needless to say is that Tenerife is known to give you a best way to learn Spanish with or without its carnival with much fun.